Leader of various recording sessions beginning around 1980, sideman on numerous recording dates headed by the likes of Dizzy Gillespie and David Murray, a regular with Sonny Rollins off and on from the early 1980s until a few years ago, and leader of the Deep Blue Organ Trio beginning in 1999, guitarist Bobby Broom has been much in evidence during the last three decades. The music on My Shining Hour indicates why he is a significant presence on the scene. One might argue, as some have done, that standard tunes—those that constitute what is called the Great American Songbook—have been performed so frequently that they are effete. Broom’s treatment of them on this CD offers convincing evidence for concluding that this is not the case, that standards have endured for a reason: they are rich enough to inspire seemingly endless interpretations. 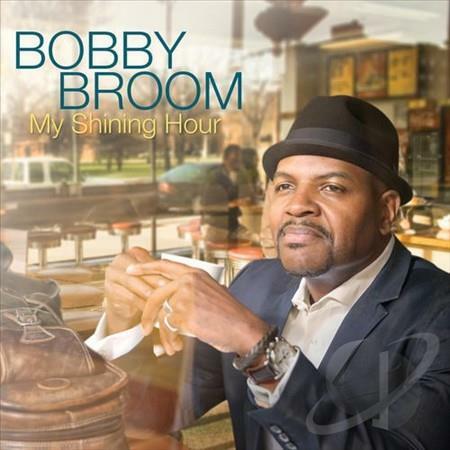 After deciding to record an album of such material and determining the selections, Broom had to consider the mood he wished for him, bassist Dennis Carroll, and drummer Makaya McCraven to establish. Perhaps surprisingly, he risked listener boredom by opting for uniformity, not variety: the overall mood is mellow, with tempos that are seldom rushed. “The Jitterbug Waltz” is the most sprightly performance, though much of “Just One of Those Things” is gritty; “The Heather on the Hill” is a slow ballad. The other selections are in a middle groove. Yet because of Broom’s inventiveness, this music is vital, not dull. Solos demonstrate Broom’s creativity. Unfailingly appealing, they evolve from the melodies but, with the exception of the guitarist’s playing on “Sweet Georgia Brown,” hardly even allude to them. That is, they are true improvisations because, while retaining the compositions’ harmonies, they are melodically original. I offer a challenge to people who listen to this release: Have someone set a CD player to start a tune at the beginning of a Broom solo and stop the machine when it concludes. While listening to the music, try to identify the composition he is playing. Doing so will not be easy. Despite the attractiveness of all the selections, “Oh, Lady Be Good” strikes me as particularly noteworthy. Broom plays the seldom heard verse alone and very slowly before his sidemen join him in stating the melody. Then, for two-and-a-half minutes Broom and McCraven participate in four-bar exchanges, sometimes with Broom playing double time. Such interactions can be predictable and tedious, but these are not. Because of Broom’s leadership of the Deep Blue Organ Trio, which infuses even standards with a blues feeling, listeners might expect My Shining Hour to include strong blues elements, even though not one of the selections is a blues. There are a few such touches, but not many. Mainly, Broom, Carroll, and McCraven treat the compositions respectfully, capturing their moods and letting their natural beauty emerge. Yet what most recommends this CD is Broom’s soloing, which is imaginative and engaging.